Installing a new patio for your back yard or garden isn’t all that difficult as long as you have some help. Unique Companies can help to assure that your original design is compatible with your property and your climate. One of the most common problems with the new patio installation is the lack of professional help in the planning and design. Quite often this creates real issues when it comes to the overall look and how the finished product plays out. Most of us aren’t entirely cognizant of all the problems that we can run into when we’re planning a new patio. Aside from considerations such as the type of stone or cement or wood that you’re considering, and how that will play out in your area, you’ll also going to want to think about things such as the placement of underground piping, wiring, and water lines. Basically you’ve got a very few choices to make when it comes to installing a new patio. You can elect to install a free standing patio or an attached patio. In either case, the materials may be essentially the same, but desert landscaping requires a closer look at what kinds of issues you’re facing in your yard or garden. Moisture is found in the garden area. Planning a low patio for your property and situating it in an area that is prone to gathering moisture when it does rain, means that you are going to be limited as to the time of year that you can use the patio for outdoor entertainment. Likewise pests in the area may determine that you want to build with one type of material or another. 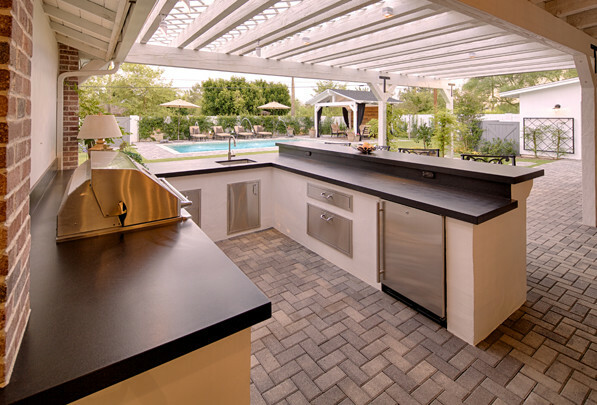 The best and most professional method of diagramming and planning for your patio, your outdoor kitchen and anything else that you’re considering building outside will be with a professional landscaper to advise and to guide you. Consider all the aspects of the patio before you begin and if you need help with your planning, contact Unique Companies.